The non-uniform genetic background of a mouse strain may lead to dispersion of phenotype data in the population to analyze. It is desirable to analyze the phenotype using a strain of the uniform genetic background. Therefore, we had established the high-speed genetic profiling system in order to evaluate the genetic background of the client’s mice. This system gained speediness and simpleness by 384 plate-based TaqMan assays method. 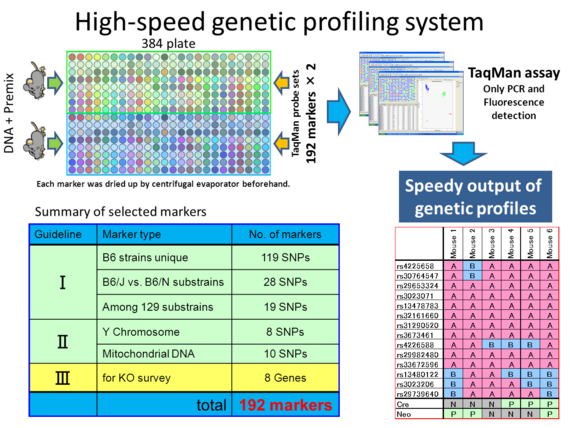 To scan the genetic background of mouse whole genome, we selected 192 TaqMan probe sets as DNA markers based on the following three guidelines. A total of 166 SNPs markers located on autosomal and X chromosome in mouse genome were selected to evaluate the uniformity of overall genetic background and/or the replacement to backcrossing strain while generating congenic strains. 119 SNPs markers distinguish polymorphism between C57BL/6 and other inbred strains. 28 SNPs markers distinguish polymorphism between C57BL/6J and C57BL/6N substrains (Mekada et. al., 2009). 19 SNPs markers distinguish polymorphism among “129” substrains. A total of 18 SNPs markers located on Y chromosome and mitochondrial DNA were selected to elucidate paternal or maternal origin. These markers are important to check the completion of the replacement of genetic background. Because Y chromosome or mitochondrial DNA of original strain sometimes remain backcrossed strains by the mating using only one gender as backcross partner. A total of 8 markers were added for detection of transgenes as genetic modification (i.e. neo, cre, and Gfp etc.) (Nakata et. al., 2009). The purpose of these markers is to confirm the expected and unexpected remains of sequences integrated in the genome. We realized speedy output of genetic profiles for each individual by establishment of this system; Two sets of selected 192 markers are arrayed in each well of a 384 plate and dried up by centrifugal evaporator. Two kind of mixture consisting genome DNA from a mouse and TaqMan premix are added each well of a plate. All genotypes on 192 markers are detected only by one PCR and measurement of fluorescence strength. Nakamura S, Nakata H, Moriwaki K, Obata Y, Yoshiki A. Exp Anim. 2. Simultaneous detection of multiple transgenes for genetically-modified mouse strains. Nakata H, Hashimoto T, Seki Y, Mekada K, Obata Y, Yoshiki A. Exp Anim.